This article evaluated the effectiveness of Mulligan’s technique for adhesive capsulitis of the shoulder, primarily in the stiffness phase. Effectiveness was measured as pain relief and improvement of functional capacity. Mulligan’s technique “combines the sustained application of manual gliding force to a joint, with the aim of repositioning bone positional faults while enabling concurrent physiological (osteo-kinematic) motion of the joint” (see Figure 1). Essentially, this means repositioning a joint to enable proper motion while taking that joint through pain-free passive and active range of motion (ROM). In this study, 40 subjects were randomly split into two groups. The first group received hot packs (HP), transcutaneous electrical nerve stimulation (TENS), and passive stretching exercises in flexion, external rotation, internal rotation, and abduction. The second group received HPs, TENS, and the Mulligan technique. The Mulligan technique was used to increase shoulder flexion, elevation, and internal rotation. Three sets of 10 repetitions were applied, with a rest interval of 30 seconds between each set. Patients were treated 5 days per week for 3 weeks. For passive stretching, stretches were maintained for 30 seconds, with 15 seconds of rest between each stretch. Each patient was evaluated using the visual analog scale (VAS) for pain, passive and active ROM, Constant score, Shoulder Disability Questionnaire, and patient-therapist satisfaction. These were measured at baseline, post-treatment sessions, and after a 3-month follow up. Results indicated both groups showed improvement in all areas, however the second group showed significant improvement in the following outcome measures: pain, ROM, shoulder scores, and patient-therapist satisfaction. The principles of this treatment method (Mulligan’s technique) are similar to the likes of Maitland and Kaltenborn (see below for details). 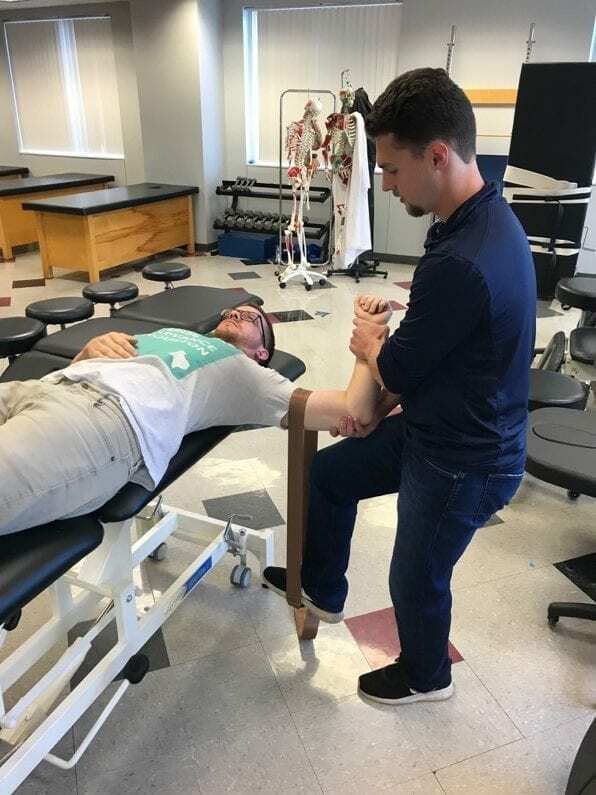 Mobilization with movement (MWM) is a specific Mulligan technique used in this study, which was first coined by Mulligan in the 1980s and is “the concurrent application of sustained accessory mobilization applied by a therapist and an active physiological movement to end range applied by the patient. Passive end-of-range overpressure, or stretching, is then delivered without pain as a barrier” (1). The therapist looks for what is known as the “PILL” response: pain free, instant result, and long lasting. If these results aren’t found, then this technique is not indicated. Mulligan’s technique is more effective than simple 4-way stretching exercises because not only does it provide proper movement within the joint through guided ROM, but it also stimulates an analgesic effect. Physical therapy that includes manual therapy typically results in decreased pain, increased ROM, and increased function, and Mulligan’s technique is no different, particularly in terms of adhesive capsulitis (2, 4, 5). 1. “A passive accessory joint mobilization is applied following the principles of Kaltenborn. This accessory glide must itself be pain free. 2. During assessment the therapist will identify one or more comparable signs as described by Maitland. These signs may be; a loss of joint movement, pain associated with movement, or pain associated with specific functional activities. 3. The therapist must continuously monitor the patient’s reaction to ensure no pain is recreated. 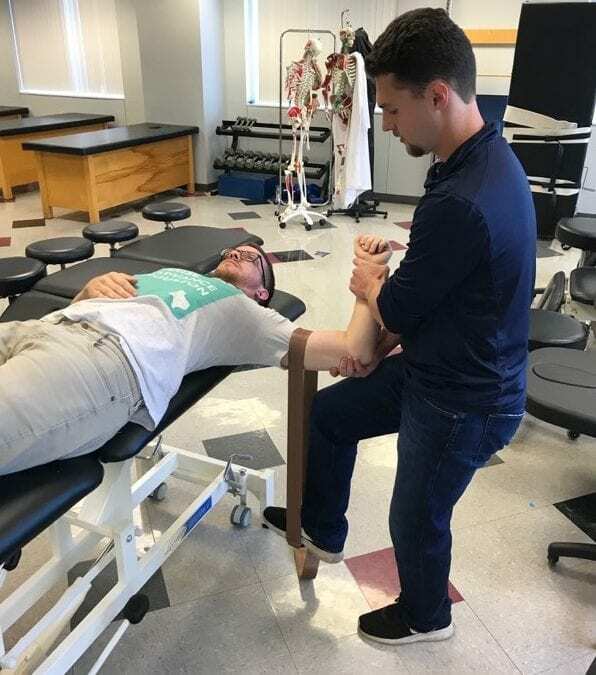 The therapist investigates various combinations of parallel or perpendicular glides to find the correct treatment plane and grade of accessory movement. 5. Failure to improve the comparable sign would indicate that the therapist has not found the correct treatment plane, grade of mobilization, spinal segment or that the technique is not indicated. Figure 1 is included below in order to gain a visual understanding of the Mulligan Technique. This example is provided with the patient in the supine position, as internal rotation is the motion seeking improvement. A belt is used to provide a gentle posterior glide of the humerus, while the right hand is providing gentle traction, in order to create a postero-lateral glide of the humeral head. The left hand guides the patient in passive and active ROM in order to achieve improvement of internal rotation. 2. Placzek JD, Roubal PJ, Freeman DC, Kulig K, Nasser S, Pagett BT. Long-term effectiveness of translational manipulation for adhesive capsulitis. Clin Orthop Relat Res 1998; 356: 181–191. 4. Roubal PJ, Dobritt D, Placzek JD. Glenohumeral gliding manipulation following interscalene brachial plexus block in patients with adhesive capsulitis. J Orthop Sports Phys Ther 1996; 24; 66–77.